Abigail Murphy stands six feet tall and eats eight cups of dog food a day. She is a high-energy Great Dane with a sweet personality who loves to snuggle on the couch with Dad. Abigail came to the OSU Veterinary Teaching Hospital for elective surgery to be spayed and get a gastropexy (stomach tack). Large, deep-chested dogs like Abigail are at higher risk for a disease commonly known as bloat or stomach twist. Bloat occurs when the stomach expands with either food or gas, obstructing the entrance and exit. As the stomach continues to dilate, it can rotate on its axis which is a life threatening condition. A gastropexy attaches the stomach to the body wall, preventing this rotation. Abigail’s surgery was performed by Dr. Milan Milovancev and Dr. Lea Mehrkens who are board-certified, soft tissue surgeons. They used a minimally invasive technique called laparoscopy, where a tiny camera and surgical instruments are inserted through small incisions. The advantage of laparoscopy is less pain and quicker recovery, which is very beneficial when you have a 170-pound dog who needs to be kept inactive to heal. “It was especially challenging keeping her quiet and out of trouble because we have an eight month-old puppy who wanted to play with her,” says Laura Murphy. 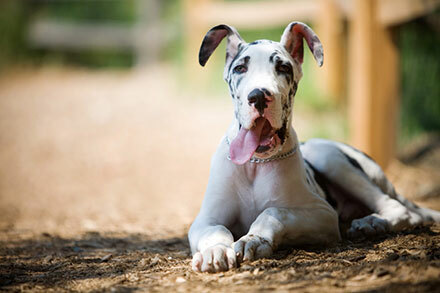 Owners of deep-chested breeds like Great Danes, German Shepherds, and Standard Poodles can elect to get their dog a gastropexy, or they can minimize the risk of bloat by limiting strenuous exercise after eating and drinking, slowing the rate of food consumption, and feeding frequent small portions rather than infrequent larger portions.